1976 Coast Guard Boating Safety Team 03 . Fifty years ago today on June 30, 1966, the U.S. Army turned over Governors Island to the Coast Guard. This step was the beginning of the final chapter in the military use of the Island, and set the stage for New York to get a public park more than thirty years later. In 1964 the Army announced that its role on Governors Island would cease, and elected to leave the Island. It would consolidate First Army and other units at Fort Meade, Maryland. The expense of maintaining structures from the 19th Century, and vast landscaping, proved to be too great for the service. The staff relocated service personnel and families off the Island. It packed up many Army mementos as well. The Army handed over the keys to Governors Island in a ceremony at the Chapel of St. Cornelius the Centurion, the limestone landmark that still stands on the edge of Nolan Park. The organist performed “Onward Christian Soldiers” as the uniformed officers and enlisted members paraded in. The service flags were exchanged; at one time the chapel had more than a dozen Army flags and souvenirs hanging inside. Soldiers climbed on top of Fort Jay and fired one of the vintage Rodman cannons. Unfortunately, too much of a loud thing caused the windows in Building 110 to shatter and the grass around the fort caught fire from the hot gun’s wadding. While the fire company extinguished a small brush fire, the ceremonies continued. The Coast Guard went about remaking the Island to suit its needs. It was the largest Coast Guard base in the world. The service placed anchors where cannons once stood. In 1968 the base at St. George on Staten Island transferred operations to the Island. Vessel Traffic Services (VTS) New York operated from Governors Island to monitor harbor traffic; the VTS system operated here until the service left. 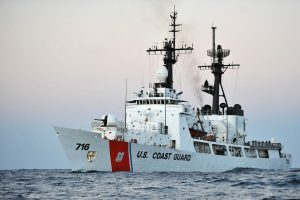 ATLANTIC OCEAN – The Coast Guard Cutter Dallas sails at dusk Feb. 14, 2012. The ship is currently on its last patrol before it is decommissioned in March. U.S. Coast Guard photo by Petty Officer 2nd Class Patrick Kelley. The most visible change to the Island was that it was now the homeport to cutters. The cutter Gallatin was the first U.S. military ship with women assigned permanently. Twelve enlisted women and two officers reported in 1977. The Coast Guard was the first U.S. military branch to assign women on an unrestricted basis on ships. Other vessels here were the Dallas, Red Beech, Sauk, Manitou, and Morgenthau. The Coast Guard was involved in heroic and dangerous rescue missions countless times from Governors Island. Some of the most important were the 1973 rescue of 64 crewmen in a collision between the container ship Sea Witch and tanker Esso Brussels off Brooklyn. In 1993 the Rockaway Beach disaster of the Chinese smuggling ship Golden Venture plunged more than 300 passengers into the surf, with Coast Guard and NYC emergency services rushing to the rescue. 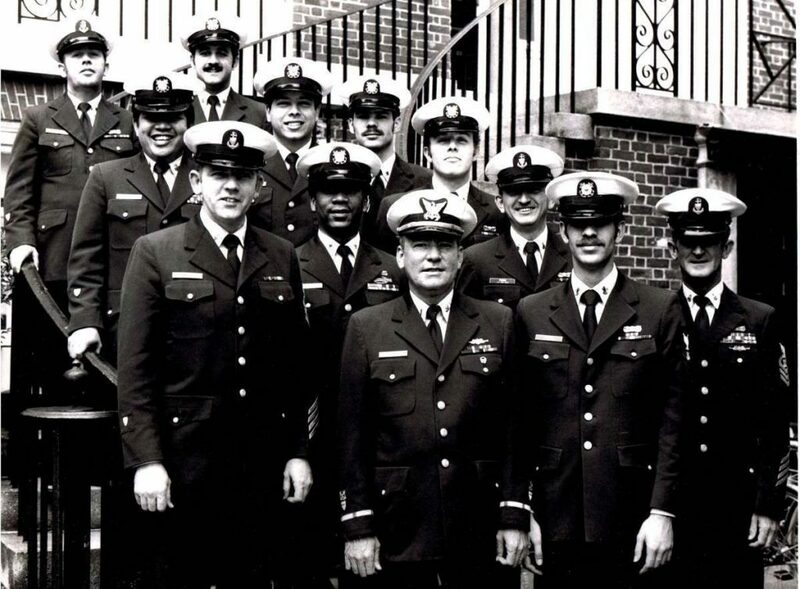 For barracks and training, the Coast Guard used Liggett Hall as both housing and classrooms. It moved training center schools from Groton, Connecticut, in 1967. Basic and advanced courses were taught here such as damage control, electronics, search and rescue, store keeping, navigation aids, and telephone repair. In 1967 a new wing was built for barracks and staff housing. Pershing Hall, which was once home to First Army, became the home to the Office of the Commander, Atlantic Area. All of the administration buildings were repurposed, while several dilapidated buildings were razed. Among them was a guesthouse, on the edge of the Parade Ground, which was replaced by a Super 8 Motel. But while the Coast Guard adapted the Island, it became a small town for service members and their families. It had a large commissary, a Post Exchange (the PX was combination department and electronics store). A new school was built in 1972 (after it was demolished, its time capsule can still be found on Liggett Terrace). Apartments were constructed on the south end and overlooking Buttermilk Channel. For the families on the Island, living on Governors Island was a special place. More than thirty years later they remember the time fondly, and some have come back recently to tour their former homes. 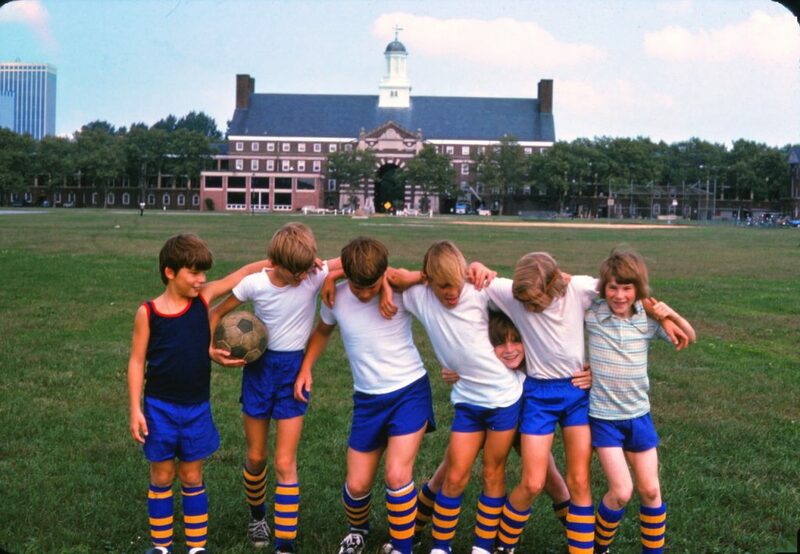 The Governors Island Cougars in 1975. Photo courtesy of Nick Pusloskie. 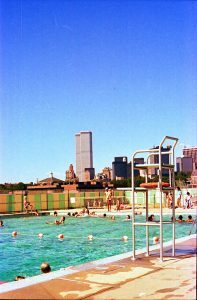 The Governors Island pool in 1977. Photo courtesy of Nick Pusloskie. It was the Coast Guard who pushed for landmark status for the Island in the 1980s. It was also the service’s work to maintain and preserve the historic structures that allow them to be used today. If you’ve ever been to Fort Hancock on Sandy Hook, New Jersey, some of those Army structures are from the same era and construction as those from Fort Jay. But when the Army abandoned Fort Hancock in the 1970s, they fell into disrepair and are now wrecked. The Coast Guard still has a presence in New York Harbor. It’s footprint may be smaller, but the legacy it left on Governors Island is a big one.